The bell was cast in Korea and shipped to the United States. Weighing 17 tons, with a height of twelve feet and a diameter of 7-1/2 feet, the bell is made of copper and tin, with gold, nickel, lead and phosphorous added for tone quality. When it was built, it cost the Korean people $500,000. Four pairs of figures, each pair consisting of the Goddess of Liberty holding a torch, and a Korean spirit , are engraved in relief on the body of the bell. Each of the Korean spirits holds up a different symbol: a symbolic design of the Korean flag; a branch of the rose of Sharon, Korea’s national flower; a branch of laurel, symbol of victory; and a dove of peace. The bell has no clapper but is struck from the outside with a wooden log. 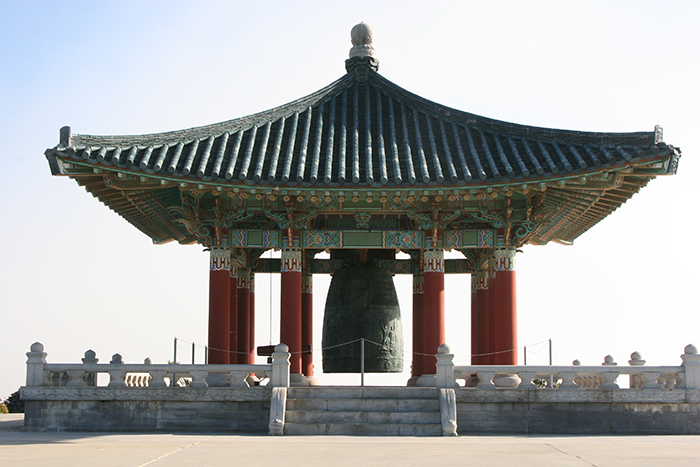 The bell is set in a pagoda-like stone structure which was constructed on the site by thirty craftsmen flown in from Korea. It took them ten months and costs $569,680. The pavilion is supported by twelve columns representing the twelve designs of the Oriental zodiac. Animals stand guard at the base of each column. Recently the Korean Bell underwent extensive renovation and restoration. On January 10, 2014 the Tarps were removed . 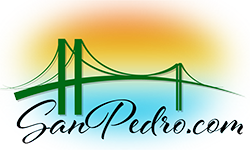 Resting peacefully on the knoll overlooking the sea gate from which U.S. troops sailed into the Pacific, the bell site affords an unsurpassed view of the Los Angeles harbor, the Catalina Channel and the sea terraces of San Pedro hill. The bell is rung each year on: Independence day, July 4, National Liberation Day of Korea, August 15 and New Year’s Eve, September 17 to coincide with bell ringings around the country to celebrate Constitution week, also on January 13 for Korean-American Day. The Bell is also rung on the 1st Saturday of the month at 12:15 p.m.